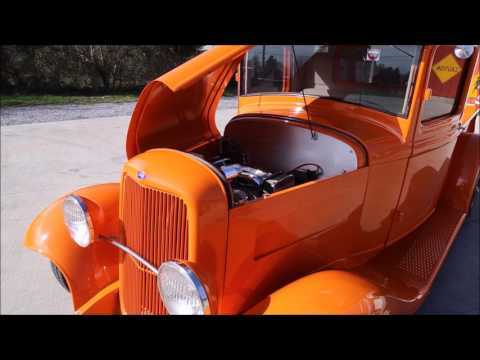 Up for sale we have a 1934 Ford Pick Up Street Rod. This is a steel body truck that has had an amazing restoration done. The body is straight with good fit of the panels. It has the fixed hood panels with a side open hood. When you look at the bed it has a great fit with a new wood bed installed. The fuel tank is under the bed with a floor mount fuel door. Up front you can see the front bar mount headlights and out back the tail lights are under the tailgate. The body is covered in the Orange Base Coat Clear Coat Paint that has been buffed to a deep rich shine. For wheels, it's sitting on 15” Halibrand's with 7's up front and 8's out back. On the inside, it's done in Tan with the seats, door panels, and headliner being done in tweed. It has an overhead console that houses the CD player. The sound system is installed in the custom kick panels. You'll notice the steering column is tilt with a Lecarra Wheel. Also, the gauges have been upgraded to VDO and the Emergency Brake is in front of the seat. Finally, we will look at the drivetrain of the Ford. Under the hood, it's powered by a 350 V8 that's dressed with a Chrome Intake and Polished Aluminum Valve Covers. The trans is a 700R that's mated to the 8” Ford that has a four-link set up and chrome coil overs. Under the front, it has the chrome axle that retains the mono spring and chrome front links. The brakes are disc and it has been fitted with Vintage AC. For exhaust, it has shorty headers with duals and turbo mufflers.